The Aztec Empire was established by the Mexica people in the region of Central Mexico. These people migrated from the north and founded their city-state of Tenochtitlan on the swampy island of Lake Texcoco. With the passage of time, the city became the largest and most vibrant Mesoamerican city. The Aztecs built some of the most magnificent architectural marvels some of which continue to exist to this day. Most important of these Aztec buildings are the pyramids which served as their religious temples. Just like Aztec art and culture, Aztec buildings and architecture were also influenced by the classical Mesoamerican civilisations. The architecture used in the Aztec pyramids already existed in previous civilisations and Aztecs added their own elements to it. They founded their city of Tenochtitlan in 1325 and then went on to build some of the finest Aztec buildings in the region. This included Aztec temples, palaces, as well as other buildings. The city-state of Tenochtitlan was the capital of the Aztec Empire and thus it was here that the Aztecs built their most important buildings. This included various small and large temples, prostis, the ball game court, the eagle’s house, and other Aztec buildings. Among these Aztec buildings, the pyramids were the most important since they also had religious significance. The ball game court was called “tlachtli” and nobles often played it with heavy betting. One of the most important Aztec buildings was the palace of the emperor which itself was nothing short of an architectural wonder. The most important Aztec buildings were of course their temples and places of worship. 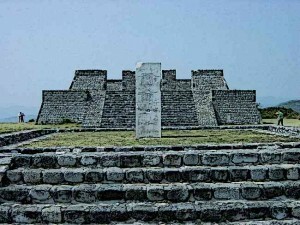 There were small temples but the larger ones were constructed atop the Aztec pyramids. These temples were called “Teocalli” by the Aztec people meaning “god houses”. One of the most important of these temples was Templo Mayor which had a height of 60 meters and was completed in 1497. It had two temples dedicated to gods Huitzilopochtli and Tlaloc respectively. The temple was accompanied with various other smaller temples and public buildings. 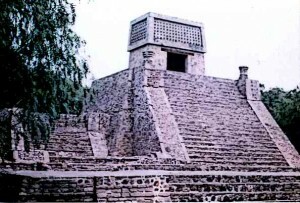 Other important religious buildings of the Aztecs included The Pyramids of Sun and Moon, The Great Pyramid of Cholula, The Great Pyramid of Teopanzolco, and others. The Aztecs had various places for entertainment and socialising. For instance, they had their ball room court called Tlachtli. Playing ball game was perhaps the most important form of entertainment for the Aztecs and it was played by the people of all social classes and ages. They specifically built ball room courts where even nobles played the game with heavy betting. The court was shaped like a capital I with serifs and was oriented north-south or east-west in order to represent the heavens. Aztec buildings for leisure also included steam baths which also had medical and spiritual significance. The Aztecs also had large central marketplace where, other than trading, they socialised. Learning and education was of supreme importance for the Aztecs and education was deemed necessary for all Aztec children. The most important Aztec building for education and learning was called “Calmecac”. It was a school for the children of nobility where they were given a rigorous religious education and military training and taught various other disciplines such as literature, history, medicine, and engineering etc. The education centre for the commoners, on the other hand, was called “telpochcalli” and it imparted basic military training in addition to learning from the heart. The scope of education in telpochcalli schools was limited compared to that in calmecac schools. Aztec buildings included a variety of grant structures such as the great pyramids where their religious temples were situated. Among the most magnificent Aztec buildings was also the palace of the Emperor Moctezuma II at Tenochtitlan. Other than a court and living quarters, this palace also had two Zoos, a botanical garden, and an aquarium. The grand design of the palace can be imagined from the fact that 300 people were employed to take care of just the animals in the Zoos. Palaces also existed in other city-states of the Aztec Empire although the one at Tenochtitlan was the the most grand in terms of size and design. The Aztecs used a variety of local and imported materials for the construction of Aztec buildings. Among the local building materials, Aztecs used wood and local soil in addition to a special kind of sun-dried brick called the adobe. These were the most commonly used materials for the construction of Aztec buildings. For the construction of large homes of the nobility, lime plaster was imported for walls and floors. Other common types of building materials included straw, stone, sand, and clay. For the construction of houses, the Aztecs used fairly uniform methods. Commonly, windows in homes had two parallel sides and two sides of a different length. Among the grand public buildings, for the construction of the giant pyramids a large platform was constructed for the base of the pyramid. Stone blocks were used in the construction of the platforms and steep, double staircases were constructed leading up to the temples. Aztec construction methods included a variety of symbols as part it’s decoration and style. Since religion was extremely important for the Aztecs, Aztec buildings made rich use of religious symbolism. Even common houses included special places for worship for all the family. The religious symbolism was of utmost importance in the construction of Aztec pyramids. Their geometrical shape and proportions were made in accordance with the direction of the sun since the sun was of central importance in Aztec religion and life. Symbols such as eagles, serpents, conch shells, and sea creatures were incorporated in the architectural designs because of their religious meaning and significance. The Mexica people of the Aztec Empire built some of the most marvellous buildings of the Mesoamerican civilisations. Aztec buildings are in particular famous for their grand pyramids and for the construction of which meticulous care was taken in terms of proportion and geometrical uniformity. Religious symbolism was very important in the architecture of Aztec buildings and a variety of symbols were incorporated into them which signified different religious concepts.